See Milford Sound by air and water, flying round-trip from Queenstown for a small-craft boat cruise through the famous fiord. 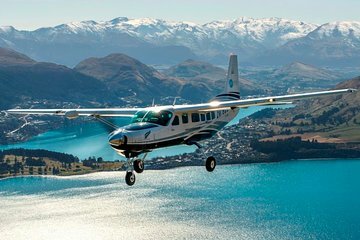 Save time on this half-day tour as you soar over the World Heritage–listed landscape of Fiordland National Park. Landing at Milford Sound, trade your wings for watercraft and a sightseeing journey with experienced naturalists. You’ll learn about the wildlife and geology of the scenic waterways at one of New Zealand’s top natural wonders. Includes round-trip hotel transfers and a boxed lunch. Take a once-in-a-lifetime journey to Milford Sound, one of the South Island’s top destinations. Your half-day tour begins with hotel pickup in Queenstown and a transfer to the airport for check-in and a safety briefing. Taking off to Milford Sound, your pilot narrates the natural wonders located within Fiordland National Park, part of the UNESCO-listed region of Te Wahipounamu. Peer through the aircraft’s large windows for optimal viewing of the unfolding scene below, including blue waterways that cut through the dramatic, snow-dusted Southern Alps. After a gentle landing at the airstrip in Milford Sound, swap your plane for the boat, which carries a maximum of 75 passengers compared to a typical 300. The smaller-sized craft allows your captain to bring the boat up close to majestic cliff faces and cascades. Expert naturalists inform you about Milford Sound’s geology and any wildlife sightings including fur seals, bottlenose dolphins and Fiordland crested penguins. Snap photos of Mitre Peak and taste pure water from the glacial melt at Stirling Falls. You have the option to pre-order a boxed lunch to be served during your cruise (sample menu below); otherwise, purchase a meal or snack from the onboard cafe. Complimentary tea and coffee are provided to warm you throughout the 2.5-hour cruise. If you’re interested in learning about boat operations firsthand, be sure to visit the captain’s bridge during the return voyage. 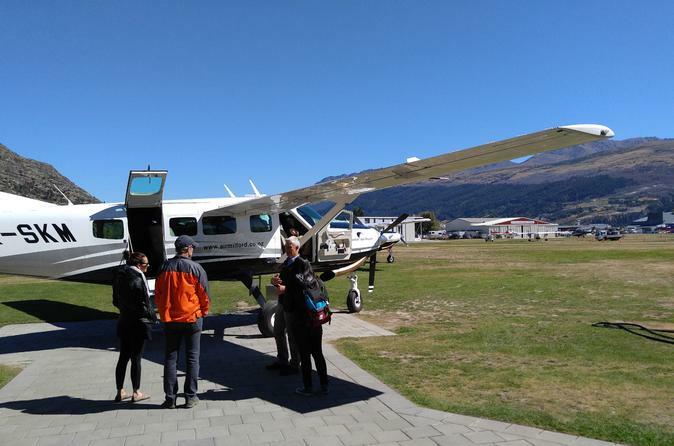 Then disembark on shore for the scenic flight back to Queenstown, where you’ll make a ground transfer back to your hotel. This was an excellent and well worth the expense. We had a very fantastic trip. Flight was gorgeous, pilot tried to tell us interesting things, the cruise was great and food delicious. This was one of the highlights of our very busy, jam packed adventure in New Zealand. The weather was perfect, the flight family crew was wonderful and the cruise was great. Air Milford even provided us with a drink and cheese and cracker plate on the cruise! I cannot even put into words how magnificent the flights were. Flying through the mountains was breathtaking and totally worth the extra money you put into this day trip. You save so much time and the views are INCREDIBLE. People are crazy not to splurge on this tour! Great tour! The flight over to Milford was a great experience and it was awesome flying with Air Milford. The cruise was amazing. Small hiccup on the flight back but it was smoothly adjusted for. Highly recommended. This really is one of those special life experiences. Apart from getting you to Milford Sound the flight itself is worth the trip. Seeing the lakes and mountains from above is a breathtaking experience.  This trip is subject to weather conditions but the customer care we received was first class. This is a must do trip if visiting the South Island of New Zealand! For those who don't know the drive from Queenstown to Milford Sound is 4 to 5 hours each way. That can make for a really long day especially if you do the 2 hour nature cruise. The flight was amazingly beautiful and Air Milford was a great company to fly with. On the 35 minute flight you get to see all of the huge mountain peaks as well as all of the lakes, things you won't see in a car or bus. Once landed the pilot walks you to the docks, which is beautiful, and gets the boat tickets for you. The lunch onboard the boat is buffet and is pretty good. The 2 hour nature cruise is awesome! You travel through the sound all the way to open ocean and back again. The captain took us under 3 waterfalls and if you were on the bow you got soaked! After the great cruise our pilot met us at the docks and walked us back to the plane for the 30 minute fly back. He flew a different route back so we got to see more beautiful scenery. We were in New Zealand a total of 16 days and we packed just about everyday with something and this is by far the best thing we did! This was a tremendous excursion. I was mostly looking forward to the cruise, but the flight from Queenstown to Milford Sound was really even more spectacular. We flew with Hank, the owner of Air Milford, and he was very professional, courteous and an excellent tour guide as well as pilot. The cruise also lived up to expectations, even though it was cloudy and cold. Highly recommended. The flight over the mountains to Milford Sound is arguable prettier and more exciting than the fjord itself. Air Milford did a good job of flying and organizing. The tour was wonderful, just a 30 minute flight each way rather than a 5 hour drive! The Milford Sound was spectacular and we thoroughly enjoyed our trip. Be wary of bad weather though as spoke to a few people who couldn't do flights for that reason, even if it looks like a lovely day in queenstown. It was a amazing trip. The best part of this trip is on the plane. It is really beautiful looking down at snow mountains, rivers, lakes， farms and sea. Amazing view that worth every dollars! The pilot was very experienced and knowledgeable. It sure beats having to drive for hours with little kids in tow.